As you all know by now, I'm a proud Rhode Island girl. Although I was raised by Midwestern parents and we didn't move there until I was 12, the most important years of my childhood were spent there so I definitely consider the Ocean State to be "home." I love going back to visit and know that those visits are numbered as my parents prepare for a move back to Michigan in the next few years. In the meantime, I'm incredibly spoiled that my company hosts a workshop in Providence each fall. It's a guaranteed visit to my old stomping grounds each year! I got to tack on a quick visit with my family this time around and packed in a few visits to local restaurants before Alex and I headed up to the Cape for a wedding. I've got a follow up post planned to tell you about dining in Falmouth, but today is all about Rhode Island! For my meetings in Providence, I was charged with tracking down some local chocolates to give our guests as gifts. This one was super easy for me as in Rhode Island, there is really only one place to go for local candy and that is Sweenor's. They're a great locally run family business that's been around for over 50 years. They use high quality ingredients and everything tastes super fresh. 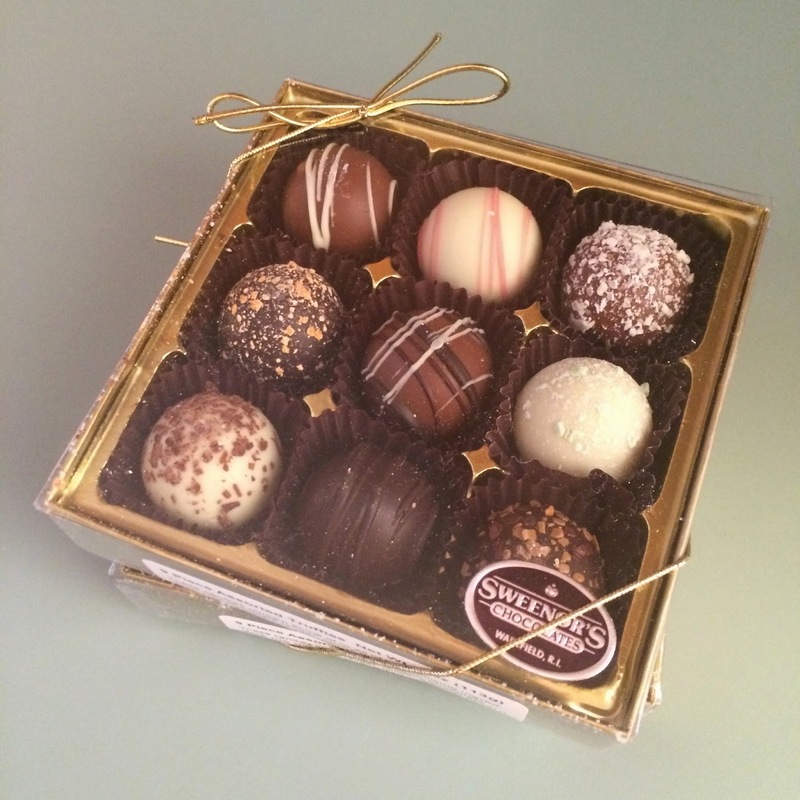 This truffle assortment was not only adorable, but delicious! That white one at right center was my favorite: minty white chocolate with a dark chocolate ganache center. Sweenor's has stores in both Cranston and Wakefield, RI. Chapel Grille is a lovely restaurant located in the heart of the Chapel View area of Cranston. Chapel View is a beautiful new mixed used development built within the restored historic Chapel View campus. The restaurant is quite large and the decor is beautiful mix of chic upscale furnishing with cozy rustic details like exposed beams and fireplaces throughout. The menu at Chapel Grile is vast and the focus is on Mediterranean flavors and is heavy on seafood, which is exactly what I want to see when dining on the east coast! I saw some pizzas go by on big wooden planks that looked amazing. Another detail of note here is that Chapel View serves fresh bread and olive oil for dipping before the meal. Our waiter came out and walked us through four different olive oils from California, Greece, Spain, and Italy and how they differed before pouring out each one for us to enjoy at the table. I love little details like that! The food here was absolutely wonderful. I started with the Summer Cleopatra Salad and really enjoyed it. 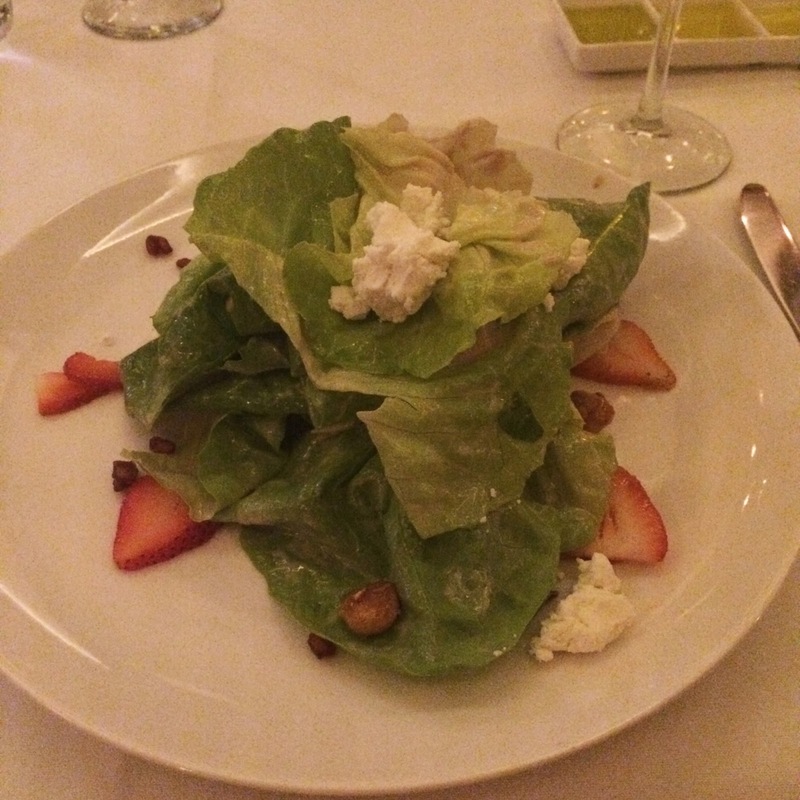 Bibb lettuce was topped with fresh strawberries, crunchy dried pomegranate seeds, spiced Marcona almonds, and creamy goat cheese. It was all tossed in a tangy sweet pomegranate vinaigrette. It was such a great summery combination of flavors-- even on the unseasonably chilly evening that I was there. For an entree, I ordered off the special menu. As soon as I heard 'lobster' and 'pasta,' it was pretty much a done deal for me. 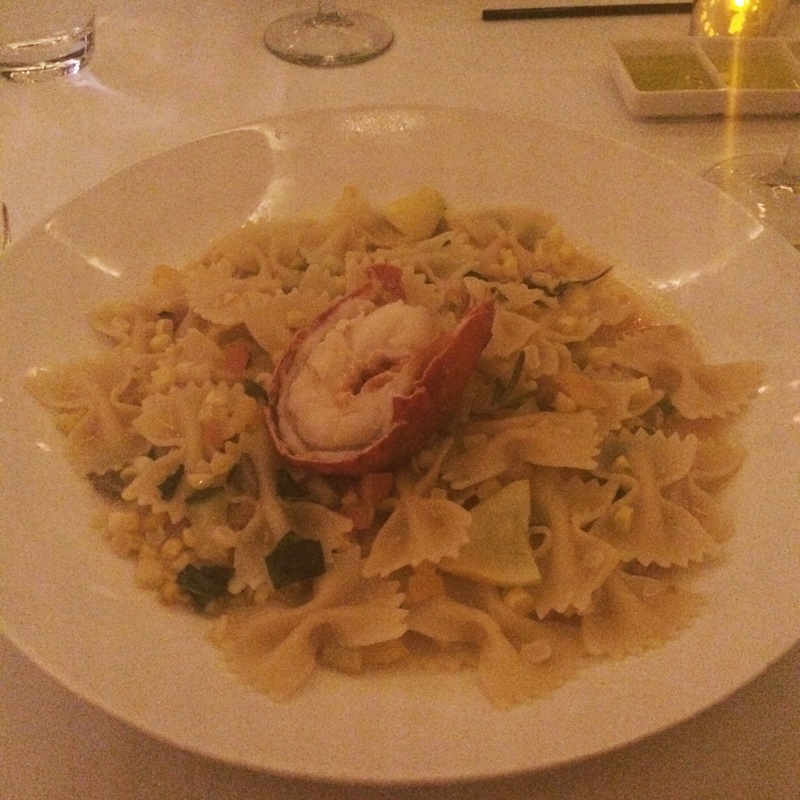 Farfalle pasta was tossed with a summer succotash of sweet corn, tomatoes, yellow squash, and green onion in a thickened lobster stock. The pasta was topped with a fresh lobster tail and it was perfect-- richness from the lobster, but an overall light dish since it was packed with vegetables and in a brothy sauce. Also, three of my dinner companions ordered the swordfish steak and raved about how good it was. Chapel Grille is definitely worth a visit and would be perfect for date night or a special occasion! I know I have told you about Iron Works Tavern before, but it's one of my parents' favorite spots so we dined there again during this visit. And it's one of their favorites for a reason: the food and the service are consistently good. The menu is composed of high quality pub fare with many great seasonal and special options available. 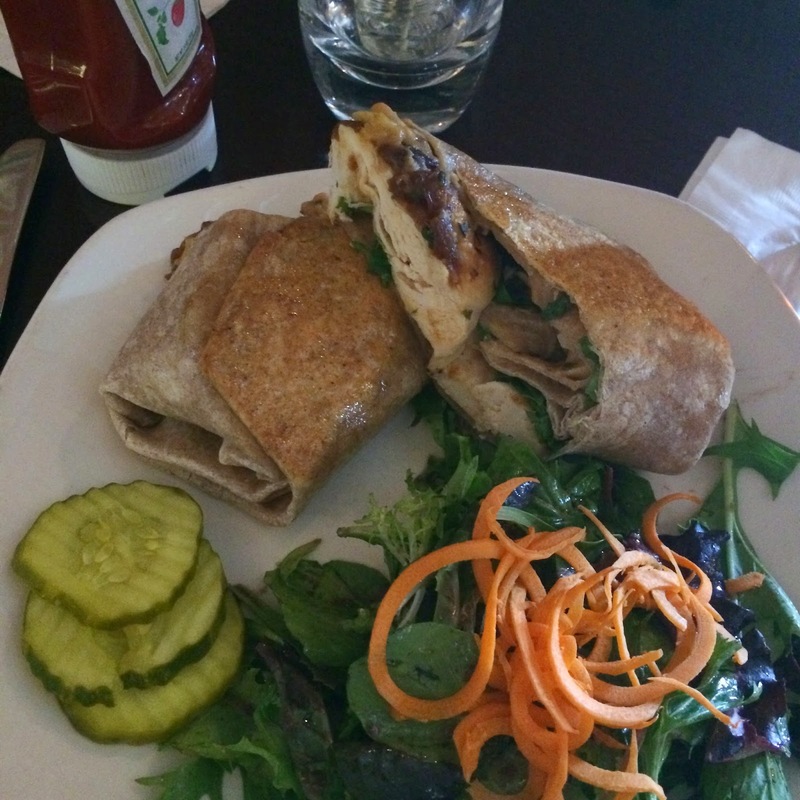 Mom and I stopped in for lunch and both ordered the same thing of the special menu: Grilled chicken breast, caramelized onions, arugula, sweet potato, and this really yummy bacon white bean spread in a toasted wheat wrap. The flavors reminded me of fall and went together so well! This is a great spot to check out if you're in the area and especially if you've got a flight out of T.F. Green Airport and have some time to kill. As it's name suggests, Tavern by the Sea is a cute little nautical-themed eatery located right on the water in my hometown. It it the quintessential New England restaurant and they have tons of outdoor seating for such a small place, so if you manage to get there on a good weather day (like we did!) then snag waterside table. Tavern by the Sea's menu is very seafood-focused, which was exactly what we were looking for that day. Alex had just flown into RI late the night before and was ready for his first lobster roll of the visit. Beyond seafood, the menu features some traditional pub fare like sandwiches, burgers, and pizza and also a few more Mediterranean-inspired dishes like hummus, souvlaki, and gyros. Alex and Emma both started with some traditional New England clam chowder. I stole a bite and it was exactly what you're looking for from chowder: thick, creamy, with a touch of that shellfish sweetness. I started with a cup of the lobster bisque, which was equally delicious. There were some nice chunks of lobster in a thick and creamy seafood stock. I ordered the Cape Cod Salad (topped with dried cranberries, candied walnuts, gorgonzola) and added a crab cake to it. 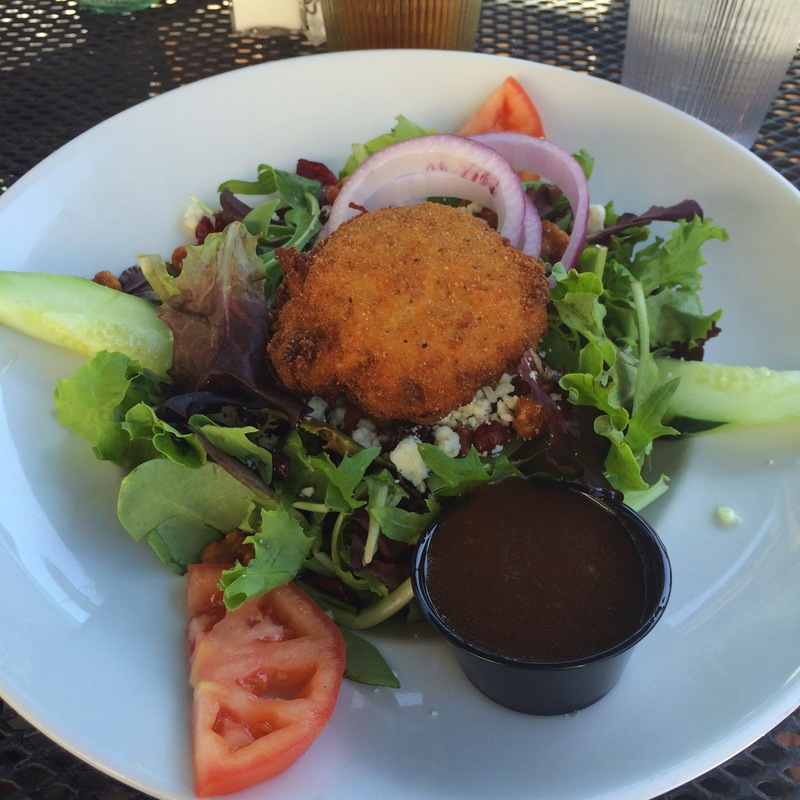 I'm a huge crab cake lover and order them almost anytime that I see them on a menu. Sadly, I was a bit underwhelmed by this one. It may be my personal preference, but this one was breaded and deep fried leaving it a bit too greasy for my liking. Alex's lobster roll, on the other hand, was a huge hit. It was stuffed with so much lobster salad that it is the kind of sandwich you need to attack with a fork before you can even pick it up. The salad was perfectly chilled and it was tossed in just enough mayo to cover the lobster without drowning it. And those fries? Also tasty. Emma and I stole more than a few off of his plate. Tavern by the Sea serves lunch and dinner. They also have an adorable little bar situated right on the waterfront deck. Perfect for a summertime New England cocktail! This review is a bit of a stretch-- in more ways than one. First, we didn't actually eat at Bertucci's in RI. Alex and I stopped at one in the south shore of Boston for lunch with his family during our visit. But since it wasn't really on the Cape and since it's one of my family's favorite Rhode Island restaurants (there is one right by T.F. Greene Airport), I decided it was worth mentioning here. I'm a bit of a chain restaurant snob. I don't often eat at them and usually don't need to since I'm so spoiled living in Chicago with great restaurants at every turn. But I just love Bertucci's. It's a regional chain with locations from Maine down to Virginia. The food isn't anything out of the ordinary, but it's always good. It was one of the first restaurants my family discovered after moving to RI and it quickly became "our" place. And when I moved to Boston after college there was one just down the street from my apartment. Alex and I frequently ordered takeout from there for movie nights at my apartment. 9 out of 10 times I order a calzone when I go to Bertucci's. I don't really order them anywhere else, but they are really good here. Typically, I like to make my own as they allow you to customize your calzone fillings. This time around though, I ordered the Tuscan Vegetable Calzone which comes filled with roasted eggplant, zucchini, artichokes, tomatoes and Asiago cheese. The calzone is packed with filling and their dough is great-- soft, but chewy (as it should be!) 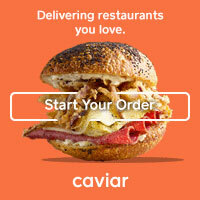 and they also use it to make the delicious hot ciabatta rolls that they bring to each table when you sit down. A word of advice: Don't pass up the bread basket at Bertucci's! Rhode Island is great! Check out the south part of the state next time-- my stomping grounds!